Will very much wanted to win the Xmas themed shoot by The studio loft. My bb girl is 8months old and this xmas festive will be her 1st yr celebrating with mummy and daddy. Beisde buying her a xmas gift, me and hb would want her to have a memorable picture taken by the studio loft on xmas theme. Love the photos taken by The Studio Loft! Would like to bring my boy for the Christmas themed photoshoot. it will be a very different Christmas present to us! i am 2 months old and wish for this christmas to have this photoshoot with my gor gor, mummy and daddy. Missed the X'mas walk-in as I didn't think that a ten-minute session with a 2-month-old baby would result in anything fantastic. But I regretted it when I saw some of the unpublished pictures from another thread. The babies look so cute with the reindeer antlers and Santa hat! Really would love to win the prize so that my baby could have her best shot on her first ever X'mas! Karel said: My mummy did make it to bring us there for the xmas theme shot. Hope that we can be pick and win a chance to have memorable shot. We wanted so much to have a xmas themed shot but we miss it.Hope we can win this chance. my mommy is my daddy too and I want to grow up remembering the many christmases that the 2 of us will have together! "My daddy is always working and busy. To date, Mummy, Daddy and me do not have a family picture yet! 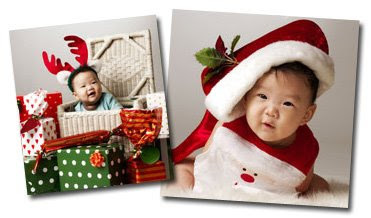 It's my 1st xmas and I'll squeal with delight if 3 of us are able to have a heartwarming xmas themed photo session!"